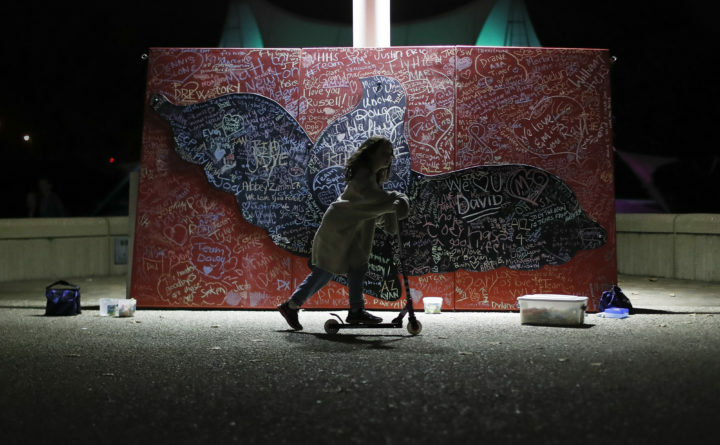 In this Oct. 15, 2017, file photo, a child plays beside a message board adorned with notes for loved ones who took their own lives during an Out of the Darkness Walk event organized by the Cincinnati Chapter of the American Foundation for Suicide Prevention at Sawyer Point Park in Cincinnati. Suicide rates inched up in nearly every U.S. state from 1999 through 2016, according to a new government report released Thursday, June 7, 2018. In North Dakota, the rate jumped more than 57 percent. In the most recent period studied (2014 to 2016), the rate was highest in Montana, at 29.2 per 100,000 residents, compared with the national average of 13.4 per 100,000. Only Nevada recorded a decline – of 1 percent – for the overall period, although its rate remained higher than the national average. Increasingly, suicide is being viewed not only as a mental health problem but a public health one. Nearly 45,000 suicides occurred in the United States in 2016 – more than twice the number of homicides – making it the 10th-leading cause of death. Among people ages 15 to 34, suicide is the second-leading cause of death. The most common method used across all groups was firearms. It is hitting many places especially hard. In half of the states, suicide among people age 10 and older increased more than 30 percent. One factor in the rising rate, say mental health professionals as well as economists, sociologists and epidemiologists, is the Great Recession that hit 10 years ago. A 2017 study in the journal Social Science and Medicine showed evidence that a rise in the foreclosure rate during that concussive downturn was associated with an overall, though marginal, increase in suicide rates. The increase was higher for white males than any other race or gender group, however. “Research for many years and across social and health science fields has demonstrated a strong relationship between economic downturns and an increase in deaths due to suicide,” Sarah Burgard an associate professor of sociology at the University of Michigan, explained in an email on Thursday. The dramatic rise in opioid addiction also can’t be overlooked, experts say, though untangling accidental from intentional deaths by overdose can be difficult. The CDC has calculated that suicides from opioid overdoses nearly doubled between 1999 and 2014, and data from a 2014 national survey showed that individuals addicted to prescription opioids had a 40 percent to 60 percent higher risk of suicidal ideation. Habitual users of opioids were twice as likely to attempt suicide as people who did not use them. High suicide numbers in the United States are not a new phenomenon. In 1999, then-Surgeon General David Satcher issued a report on the state of mental health in the country and called suicide “a significant public health problem.” The latest data at that time showed about 30,000 suicides a year. Kaslow is particularly concerned about what has emerged with suicide among women. Among the stark numbers in the CDC report was the one signaling a high number of suicides among people without a known mental health condition. In the 27 states that use the National Violent Death Reporting System, 54 percent of suicides were by people without a known mental illness. But Joshua Gordon, director of the National Institute of Mental Health, said that statistic must be viewed in context. “When you do a psychological autopsy and go and look carefully at medical records and talk to family members of the victims,” he said, “90 percent will have evidence of a mental health condition.” That indicates a large portion weren’t diagnosed, “which suggests to me that they’re not getting the help they need,” he said. Cultural attitudes may play a part. Those without a known mental health condition, according to the report, were more likely to be male and belong to a racial or ethnic minority. The problems most frequently associated with suicide, according to the study, are strained relationships; life stressors, often involving work or finances; substance use problems; physical health conditions; and recent or impending crises. The most important takeaway, mental health professionals say, is that suicide is an issue not only for the mentally ill but for anyone struggling with serious lifestyle problems. The rates of suicide for all states and the District of Columbia were calculated using data from the National Vital Statistics System. Information about contributing circumstances for those who died by suicide was obtained via the National Violent Death Reporting System, which is relatively new and in place in only 27 states.